RUSH: Mississippi. The Thad Cochran and Chris McDaniel runoff election. 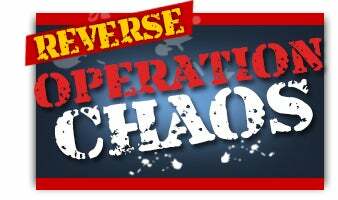 It was Operation Chaos in reverse. The Republican establishment sought victory via Democrat voters in the runoff, and they got them. It has been analyzed and it is now practically ontologically certain that without the African-American vote from Democrat-leaning counties, Thad Cochran would have lost by eight or nine percent last night. And it’s because the Republican establishment was a party to something to me that is reprehensible. I’m holding here in my formerly nicotine-stained fingers a little pamphlet that was distributed by both the Democrat Party and the Republican Party establishment. “The Tea Party intends to prevent blacks from voting on Tuesday,” and there’s a picture of Thad Cochran and all of his great achievements and a picture of Chris McDaniel, Tea Party. So the Washington establishment of both parties distribute a flier claiming the Tea Party wanted to prevent blacks from voting on Tuesday. This, combined with other efforts, secured a turnout of black Democrat voters in a Republican primary that gave Thad Cochran, in my view, a corrupt and undeserved victory. And we’ve got more on this, obviously, as the program unfolds. RUSH: So I checked the e-mail during the break and couple people said, “Rush, why still worry about it? It’s just Reverse Operation Chaos in Mississippi. I mean, you did the same thing.” For those of you who were not around, the Democrats made a movie about Operation Chaos. My name was not mentioned in the movie, but it was Operation Chaos. It was a George Clooney movie called the Ides of March. I happened to watch the movie. I didn’t know. Nobody had said anything to me about it. It’s a political film, and they’re obsessed in the first third of the movie with this Operation Chaos. What was it? Well, it was a combination electoral and programming maneuver orchestrated brilliantly — it was brilliantly conceived, flawlessly executed — by me. It was 2008, and John McCain had the Republican primaries wrapped up. So there was no drama left in the Republican side. But the Democrat side was undecided. Mrs. Clinton was still in the running, challenging Barry Obama. And there were some key primaries coming up in the spring. Indiana, Texas, couple of other places. And I (in the eyes of many brazenly) suggested a plan to Republicans, to whom it didn’t matter who won their primaries ’cause McCain had already won the Republican nomination. I suggested, if it’s possible, cross over and vote for Hillary in these remaining states just to keep this alive, just to keep some drama. It was a programming thing just to keep the subject matter from becoming boring. We didn’t want both parties to have chosen their nominees all the way by March. The conventions weren’t until the mid- to late summer. Plus, it was an effort to thwart the steamroller that was the Obama freight train. Lo and behold, it worked. In a couple of states Mrs. Clinton won and delayed the inevitable nomination that Obama won. But here’s the difference, ’cause I said that what happened in Mississippi was Reverse Operation Chaos in the sense that Democrats came out and voted for Thad Cochran. The difference is that during my Operation Chaos, the Democrats did not join me in my effort. The Obama camp did not join me and encourage Republicans and work with Republicans to come out and vote against Obama. Hillary’s people didn’t work with me. Hillary’s people did not work with Republican voters to try to coerce them to come out and vote for her. What happened in Mississippi was that the most electable Republican candidate was thwarted by the Republican establishment! The Republican establishment was part of this Operation Chaos in Mississippi. This election, it has now been statistically proven, turned on Democrat voters from African-American counties. Here is the post from Nate Silver at the FiveThirtyEight blog. “Without an increase in vote from Democrat-leaning African-American counties, Cochran would have lost by 8%.” Now, my Operation Chaos was entirely legal, and this one was, too, actually. That’s not the point. But again, when I did Operation Chaos, the Hillary Clinton forces did not join me. They were out there openly talking against it. They don’t want anybody to think that they were in league with me, heaven forbid. Now, maybe they were secretly hoping that my Operation Chaos worked, but there was no way they were aligning with me or any other Republican organization. They were just sitting on the sideline waiting for it to happen. What happened in Mississippi and that Operation Chaos was the Republican Party establishment joined with the Democrat establishment to impugn the Tea Party candidate, Chris McDaniel. Now, I’m gonna turn on the Dittocam. This is the flier that I referenced mere moments ago. Now, you may not be able to read that flier. That’s as close as I can get to it. Let me read it to you. “Tea Party Intends to Prevent Blacks From Voting on Tuesday — According to the Clarion Ledger, Chris McDaniel & the Tea Party plan to prevent Democrat voting in the Senate runoff on Tuesday between Thad Cochran and Tea Party candidate Chris McDaniel. We know the Tea Party uses ‘Democrats’ as code for ‘African-Americans.’ Don’t be intimidated by the Tea Party. “Let’s turn out for all Mississippians and vote for Thad Cochran. Thad Cochran works for Mississippi. Mississippi cannot and will not return to the bygone era of intimidating black Mississippians from voting. We must rise up on Tuesday to have our voices heard on who will represent Mississippi in the US Senate. 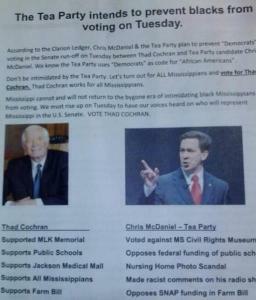 VOTE THAD COCHRAN.” This is the flier that was sent out in Democrat districts and counties that told them the purpose of Chris McDaniel and the Tea Party was to prevent them from voting. Now, it would be one thing if the Democrats did that. They do it every election cycle anyway. But for them to be joined, even if from a distance, by the Republican establishment here, simply confirms what we have long said on this program about establishment Washington. It is ruling class vs. country class. It’s elites vs. the plebes. You and me are the plebes, and they are the elites, and they are aligning together. My friend Mark Levin, F. Lee Levin, makes the point that Washington is not going to be fixed from Washington. This proves it, if there was any proof needed. Washington is not going to be fixed in Washington. The establishment is going to align itself every which way it can against any outside challenger, like this Tea Party candidate. But it does look like African-Americans. Democrat African-Americans really did secure the victory for Thad Cochran in a Republican primary. So here we have a result that is not representative of the Republican Party thinking in Mississippi. The technique that was used and the manner in which this was achieved is reprehensible. I want to go back and let you listen to what I said about all this back on June the 17th, just a little over a week ago, talking about the Tea Party and Washington. RUSH ARCHIVE: [I]n truth, the only real enemy of Washington today is the Tea Party. The Republican and Democrat establishments, the Chamber of Commerce, the whole way Washington is working, the only enemies are people who want to reintroduce free markets, get rid of crony capitalism, blow up the relationships that exist between Washington and individual businesses or business at large, Wall Street firms. You people in the Tea Party that believe in liberty, freedom, free markets, you represent the problem. To John Boehner, to the Republican establishment, to the Republican consultants, Obama is not the problem. Anybody opposed to the way Washington does business today is the problem, and that would be you and me. RUSH: Essentially the Republican base, the Tea Party voters, are considered the problem. And I could easily hearken back to the Peter Beinart column in the Atlantic Monthly that I quoted last week, in which he issued a warning to the Republican base (summarized), “Hey, this is a changing country. You know, we’re a country now that’s demographically changing. We’re changing into the triumph of the minorities, social justice and tolerance. “That’s what this country is heading to; it’s what we’re gonna be known as — social justice and tolerance — and your age-old way of doing things is old-fashioned and out of fashion, and you better learn that real fast. And the more you oppose this new America, the faster you’re going to make it happen.” So the gauntlet was sort of thrown down. This is really reprehensible. I mean, the Democrats doing this kind of thing, accusing us of racism, fine and dandy. But to have the Republican establishment as part of it is… It’s valuable in the sense that there can be no doubt now if there was any, since it’s highly instructive. Thad Cochran? Come on. I’ll tell you something else this indicates. This is something that I have sensed for many, many moons. I’ve sensed this way, way back since the Christine O’Donnell and Sharron Angle campaigns, some of the early Tea Party candidates. I think the primary thing that matters to the Republican establishment is the Senate, more so than winning the White House. The Senate is what they are all about here. I can just tell you, Thad Cochran is not gonna get this same bunch of people that voted for him in the general election that voted for him last night and yesterday. He is not gonna get nine percent of the African-American vote from those counties voting for him again. He’s gonna have to come up with some other kind of trickery or strategy if he’s to win in November. But it is the Senate and those chairmanships and being in charge of the money that seems to have everybody in the establishment salivating. Not to change the direction of the country, not to reverse the course we’re on, but to simply ascend to the captain’s seat of it. RUSH: Another difference between my Operation Chaos and the one the Washington establishment ran yesterday in Mississippi, I didn’t fund any Operation Chaos effort. It was just something to do here on the radio. I just urged people, Republicans to cross over if they could, one time, to vote in a Democrat primary, vote for Hillary, keep that race alive. I didn’t spend any money on it. I didn’t donate any money. I didn’t raise any money. I didn’t ask anybody to send any money to Hillary or anybody else, but in the Operation Chaos that took place in Mississippi, the Washington establishment, including the Republicans, are funneling money into the anti-Tea Party campaign. When you get into the numbers and you look at some of the turnout in some of these counties, it’s unreal, the level of black turnout in a Republican primary yesterday. National Review: The Flier That Got Thad Cochran Elected?